I loved the colours, that patterned card has a punched edge I did this with a Kreation Punch then adhered it to the base card. i punched out some tiny blossoms and dotted the centre of them with a matching coloured pen, glued them in threes down the side of the card then used the Inkssentials opaque gel pen to create a stitched vine effect. 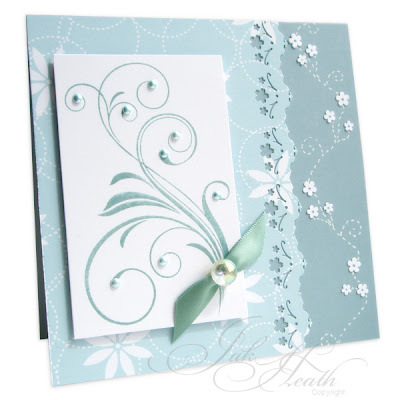 The Flourish Stamp was inked in Ocean Tides Palette ink (both from PapertreyInk) and stamped onto white card then little aqua pearls added to the flourish. Finished with a jewel and some ribbon. The ribbon is slotted through the back of the glass jewel, actually it isn't a jewel at all it is a button I found in a knitting shop but knew it would be perfect for my ribbons on my cards. Gorgeous card, Jak! Very stylish. Just beautiful, Jak, so classy. Absolutely gorgeous. Where on earth did you find a knitting shop. I htought they were now like the Dodo - extinct. Stunning card...love the handdrawn stitched vine. Just beautiful, Jak- beautiful colours. Aaaaawwww Jackie, such a stunning card ! Oh Jak, that is absolutely gorgeous. I love everything you have done with it. 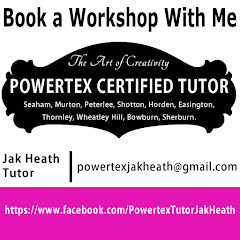 That is gorgeous Jak, I have that punch, lovely way to use it.